In 5 Steps to Run Effective Large-Scale Content Projects, I mapped the moving parts involved in setting up and running super-sized content initiatives. Astute readers raised thoughtful questions, so I’m circling around to focus more attention on the specific roles each team member plays as well as key performance indicators (KPIs), and measurement of project success. Defining the roles necessary to execute each project is a key component to its success. In smaller engagements, team members usually can chat to resolve confusion about who is doing what. However, when a big project is in motion, inefficiencies, redundancies, and gaps can snowball, and the quality of the content invariably suffers. Clearly defining and communicating roles and expectations are crucial steps toward mitigating potential breakdowns. Here’s an overview of roles that have worked successfully for us. Detail-oriented – This person reads, highlights, and knows the style guide well and can translate that knowledge into a thorough check for formatting requirements, typos, comma splices, and misplaced modifiers. Once you’ve got your teams set up and mobilized, conduct constant checks to ensure the convoy is rolling along as expected – specifically, that quality standards and deadlines are upheld. Social media metrics are a bit tricky because they are sometimes regarded as fuzzy metrics (as in, “Sure, ‘likes’ are great, but are they converting?”). We typically recommend looking at engagement metrics as part of a larger picture, including watching social traffic to the website and seeing how those visitors move through the site (and hopefully convert). Examine domain/page authority and overall rankings by reviewing and modifying pages for their aboutness, then watching to see how those pages perform. Aboutness refers to the overall content and semantics of a page and a site. It’s not about forcing keywords. It is about the website’s intent: When the content, from on-page copy and links to headers, alt tags, and metadata, tells one consistent, engaging story to the user. It’s important to set realistic measurement strategies. An executive who asks you to create a content project for a new product and says, “Get me the first slot on Google for X term,” is creating an unrealistic KPI. A more realistic goal would be, “Get an X% increase in traffic to the new product’s landing page.” Likewise, looking at current search engine rankings and conducting a thorough optimization project to improve the aboutness (overall content and semantics) of each page will certainly affect rankings. Measuring and reporting on that over time is a smart strategy, as is evaluating site authority. 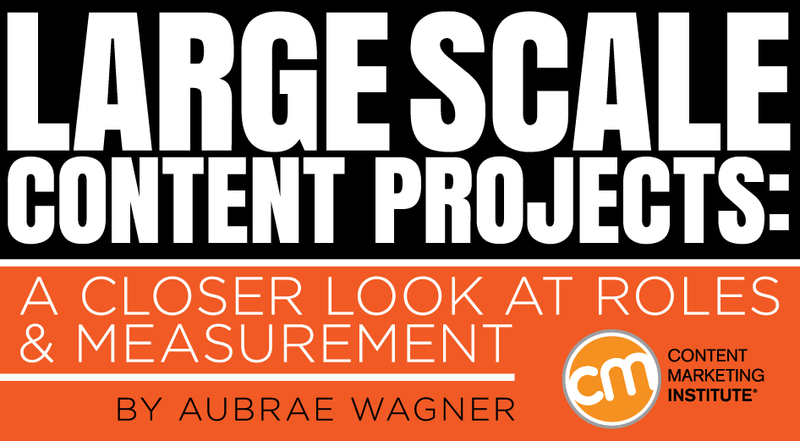 Sometimes setting measurement goals means stepping back and educating executives early so they have realistic expectations about what content marketing is and what types of results to expect from the large-scale project. Likening content marketing to a marathon as opposed to a sprint is a helpful concept. When thinking in terms of performance, think about both the macro- and the micro-conversions. Of course, with a retail product, the end goal is hearing the register ring. But studies show that people research products numerous times before they ever arrive at the register. All that research is considered a micro-conversion, and each is a key part of the buying process. Put in measurements to focus on the value of those micro-conversions as well as the macro. You can measure these by setting up campaigns in Google Analytics or other analytics tools. Be sure that you take the appropriate amount of time to think about and set up both Google Analytics and Google Webmaster Tools before you launch content. If you want to learn more about Google Analytics, Google offers a lengthy training course (about five to six hours) that gives you a deep dive into the what and how of Google Analytics. The project leader and project manager may collaborate, but there needs to be a primary point of contact for executives who should receive the updates and reporting. Timing of the reporting should be regular (we tend toward once monthly), and recipients need to know when they will be receiving these reports. With expectations set before the project begins and regular communication, the executives are kept in the driver’s seat when it comes to evaluating how the content is performing. So, that brings up the elephant in the room: What do you do if KPIs aren’t being met? By having good measurements in place and doing regular reporting, you can determine earlier rather than later what content is working and what content isn’t cutting it. This allows you to make recommendations as to what you are seeing and what needs to change. Don’t wait for the executives to spot underperforming content or to get anxious that the KPIs aren’t being met. 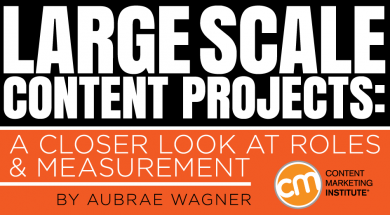 Future approval for content projects will be based primarily on the success of large-scale content projects’ KPIs. Setting up or reorganizing your content marketing team should improve overall efficiency and effectiveness. Learn more by listening to CMI webinar, The Content Marketing Service Bureau: How to Structure and Optimize Your Content Marketing Team. With more than 15 years’ experience in the areas of content production, content management and content marketing, Aubrae is Chief Operations Officer at EnVeritas Group , a content marketing agency based in Greenville, SC. Aubrae is responsible for overseeing the successful completion of client projects, ensuring that the EVG team is operating at its highest level of efficiency, and keeping the team on track overall. Aubrae oversees both US and EU operations. She holds a BA in English and an MA in Professional Communication. You can follow her on Twitter @AubraeAWagner.